Well today's the day of the new release over on High Hopes Stamps and you have to have Blog Hop to celebrate. 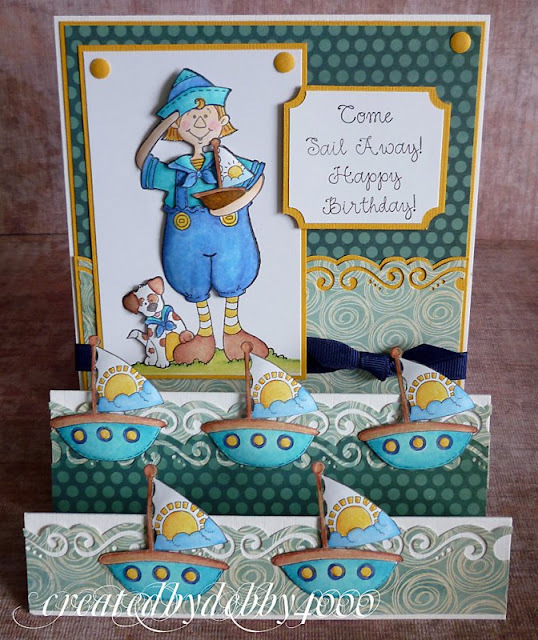 First things first here's my card today using Sailor Andy and you get the cute sailing boats too. Of course I do realise that the clourd should of been white and the sky blue, when I realised my error after colouring in all those boats I'm calling it artistic! I had to use these papers because the swirly pattern I thought would be perfect for the sea. Now but to blog hopping, you should of got here from Jeanette but if you didn't you need to start at the High Hopes Challenge Blog. Its a good idea to follow the hop because random Divas will be having surprise candy and no-one knows who it is yet. 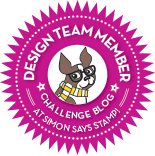 Feel the need to buy these fabulous new stamps well here in the UK you can get them from Bunny Zoe's Crafts, not from the UK check out the challenge blog sidebar you will find whose your local retailer. So where do you go from here. That will be to Cathy, don't forget to leave a comment to be in for a prize. ohhh Debby this is such a precious card. love the layout and cute border. oh debby what fun ~cannot wait to see all the new releases ~just love the papers you have used and fab design of card ~just perfect!! Оh this is such a precious card,just perfect! Deine Karte ist ganz phantastisch! Der Matrose mit dem kleinen Hund ist so niedlich und die Schiffchen sind super! What a great card! love the model and the little boats, everything fits well together!! Very pretty card Debby! Papers do look great with this theme. A wonderful card Debby,so cute. Fabulous papers, and yes, they do look like water.Great job. I love it. oooooohhhhoooo debby this is gorgeous!! what an inspiration!! your card is fabulous!!! I love the way you do 3-D. Striking card - love your colors and the little dog is so cute with him. Great layout !! Hi debby, what a great card is this. love the little boats. This card is soooooo cute! Those little sailboats and waves on the folds is genius! all i can say is WOW! LOVE the dimension!! ok Wow, i just went through a few days on your blog and while i love your use lots stuff, i love your simple stuff too! you have an amazing eye for your creations! WOW girl you just amaze me every time! !Such a fabulous job! really cute love all the details. Really nice card. Great colors, great layout and of course....super cute High Hopes stamp. Another A+ to all the designers. WOW!!!!!! Great card! Love the colors and the layering! Wow, this is fabulous!!! Love, love it!!! Fabulous step card Debby, loving how you have created the scene of waves with your punchwork. Oh WoW what a fantastic card! Brilliant idea of using the punch for the waves... really adds to the card. WOW Debbie, what a stunner! LOVE the new images and your swirly DP is perfect! Fab card Debby Love all the details with this cute image. This is awesome!! I love the layout and all of the added elements!! Too cute! Thank you so much for the work you did for this release! Great Card--love your image and the colors! The boats are so cute! LOVE your artistic blue clouds! HA! Just made me smile out loud. Beautiful coloring. Always a pleasure seeing your creativity! Those are such cute stamps, and so fun looking. Fantastic card! You're an amazing "trimmer" - I can't believe you cut out all of these images out to pop them up. And your use of the punch on the designer paper to show waves is very clever. Nicely done. Great card and I love the design. Wonderful! Fantastic card. The sailboats are so cute. Thanks for sharing, Tanya R.
Cute card with all the sailboats.